The popularity of the video is so much that within a span of one and half months the video has registered over one million viewers and with word of mouth publicity the viewership is increasing by the day. Among the celebrities who have viewed the video and praised include Bollywood superstar Hrithik Roshan, Playback singer Sunidhi Chauhan, Shreya Ghoshal etc. Inspired by American’s cappella group Pentatonix music video ‘The Evolution of Music’ is the brainchild of a capella group Penn Masala consisting of young boys. The group consists of 12 members, all students from the University Of Pennsylvania. With the exception of Sam Levenson, all the other 11 boys are Indian-Americans. They are Varshil Patel, Akshat Vaidya, Anil Chitrapu, Ashwin Muthiah, Chetan Khanna, Prashant Ramesh, Dhruv Maheshwari, Ram Narayan, Dilip Rajan, Rohan Murthy and Akiff Premjee. From a list of about 200 total songs those were picked taking into consideration both mass popularity and musical brilliance the group worked diligently and incorporated the cream de la cream songs in to the five minute and nine second video. 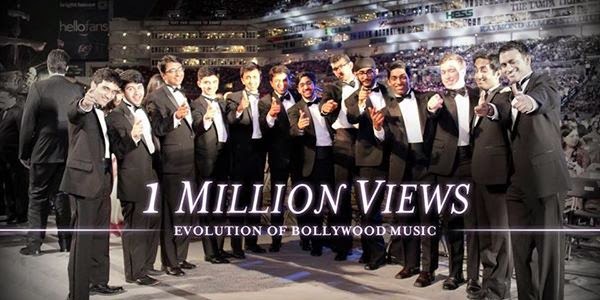 Interestingly in an era when the youth are crazy about pop music, the success of the video ‘Evolution of Bollywood Music,’ particularly among the youth is indeed incredible.